It's time to take it one day at a time! 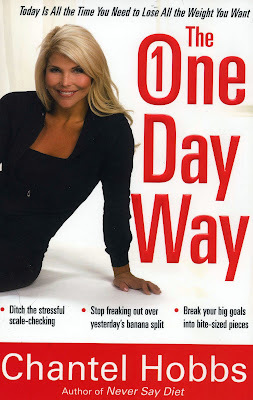 The One Day Way by Chantel Hobbs teaches you how. By focusing on food, faith, and fitness, TODAY.... you can learn how to achieve your weight loss goals and live a healthier life.... tomorrow. This IS a diet book. But in this diet book, you learn how to take it a day at a time. There are many books out there, believe me, I've tried a lot of them. But what I like most about this one, is the fact that Chantel Hobbs breaks down the bigger goal. You don't have to be overwhelmed or feel guilty when you 'mess up'. There is nothing you can do to change the past, but you have a choice of what you will do today. It's a simple concept, but a great one. After telling my husband about this book... he uses Chantel's 'One Day Way' in other areas of life as well. His new catch phrase is "I can do it... Just One More Day". This is a simple book to read. Chantel Hobbs brings her personal experiences into it, which makes it easy to relate to her. She knows where we've been, because she's been there too. She teaches us not to be interested in perfection... but in progress. I like that. It seems like a goal I can keep and will certainly try. Included in the book are simple exercises and a healthy eating plan. The One Day Way is very encouraging and I think you will enjoy it. *I received this book for free from WaterBrook Multnomah Publishing Group for my honest review. You know... One of my problems has been that I'm a perfectionist. I give up to soon because I keep the end result in sight, and I can never follow 100%. I really like how she focuses on one day at a time. That's more realistic for me... and makes it more like fun. I hope you find it enjoyable too.